Quigley" was our current show dog and faithful companion. Bred by our friend Raynor Bonnington from his first litter he was "the puppy nobody wanted" but Lyn recognised his potential from the start. 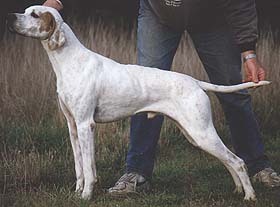 His pedigree includes famous dogs such as UK Ch.Wyndsmoor Rio Gold who came out to NZ as an older dog, Aust & NZ Ch.Crookrise Firebrand Imp UK, also Aust Ch.Byzan Hawk Imp UK and Aust Ch.Crookrise Rae Imp UK. He had a very successful show dog as a youngster, and went on to prove his quality as an adult dog having won one All-breeds BIS and two All-breeds Reserve BIS awards. He has more than earned his place by the fire, and we wouldn't be without him.